BJ SK40P CNC eszterga - CNC gép, kábelvédő, fúrótömlő; Kutenich Kft. 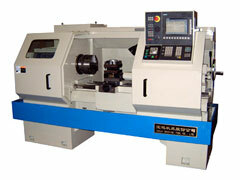 The SK40P is a CNC horizontal lathe. The spindle speed is changed mechanically in three gears together with control of a frequency changer. The lathe has 4 types (750, 1000, 1500 and 2000). These numbers denote the maximal work piece length; thus the machines can use 750 mm, 1 000 mm, 1 500 mm or 2 000 mm workpieces. The machine comes with a 4-station (standard) or 6-station (optional) turret.